In a hurry? 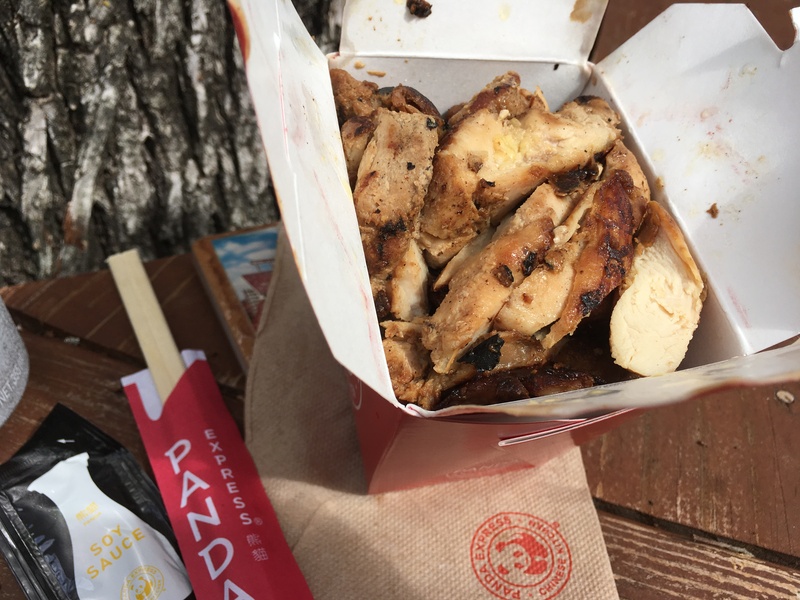 Get my Panda Express Low Carb Menu one-pager if you want to see full macros and nutritional stats for the 9 lowest carb entrees at Panda Express (<16 net carbs each). 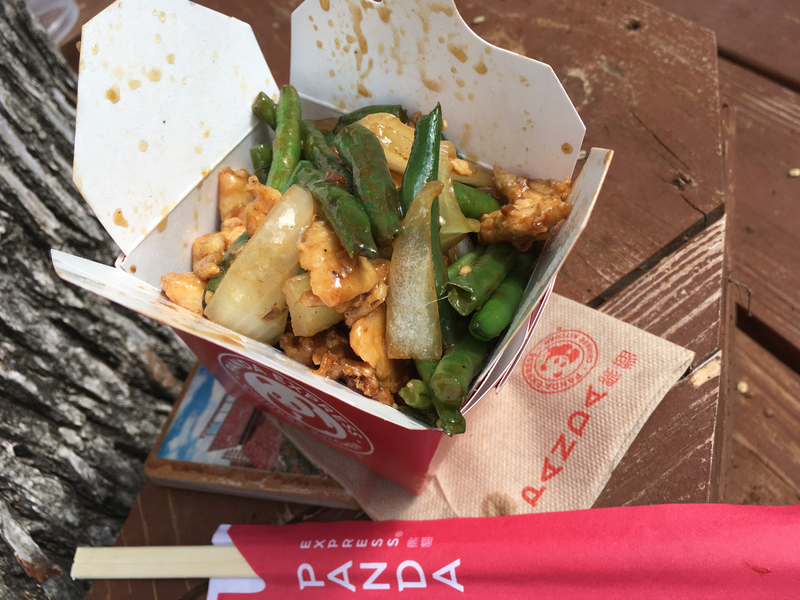 Panda Express describes themselves as a fast casual Chinese restaurant. Sounds about right. Since I'm consistently disappointed by buffet-style Chinese food and don't eat rice, I haven't been to Panda Express in over 10 years. Still, I'm excited to go back as this is the first Chinese restaurant I've visited on the fast food challenge thus far. My ingoing expectations are that they'll have too much breading on the stir fried meats, heavily sugared sauces, and entrees fluffed w/ sneaky high carb veggies like carrots, baby corn, & water chestnut. I predict that I'll need to hunt and peck around some high carb ingredients to stay within the bounds of my typical keto macros. Let's see if they can surprise me. 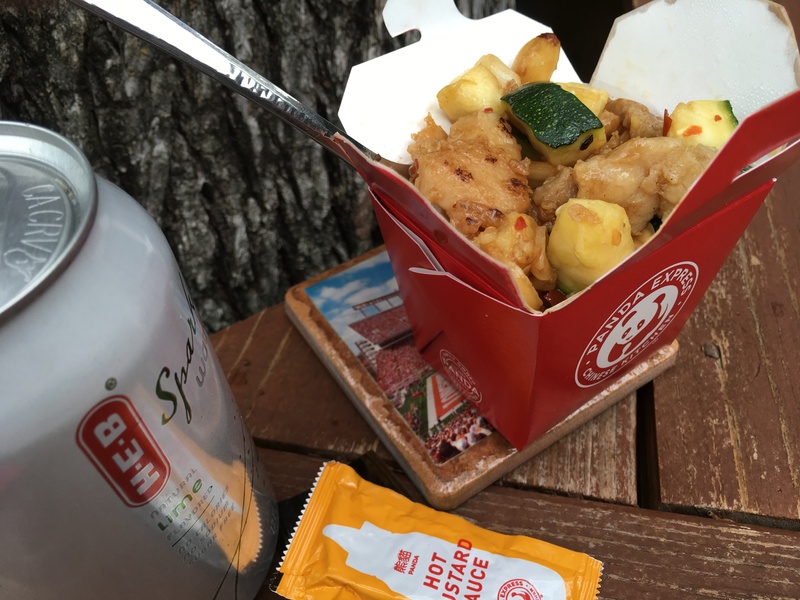 Panda Express is low carb challenging because they present several options that look somewhat keto friendly but have hidden carbs which means they need to be eaten in moderation. And I hate moderation. You can't special order because everything is pre-made and served ala carte in a buffet line. They have several different order size options (plate, bowl, and small/med/large ala carte) which further complicates the task of sticking to your macros. You can cobble together a filling meal with less than 20 grams of carbs, but it won't look much like the Chinese feasts you grew accustomed to when you were a mainstream eater. Low carb friendly – Not really, unfortunately. Low carb entrees on menu – Yes. The Grilled Teriyaki Chicken and Grilled Asian Chicken are 8 net carbs and 300 calories. They also have 7 more traditional Chinese entrees that are moderately low carb ranging from 10-15 net carbs and 200-300 calories. 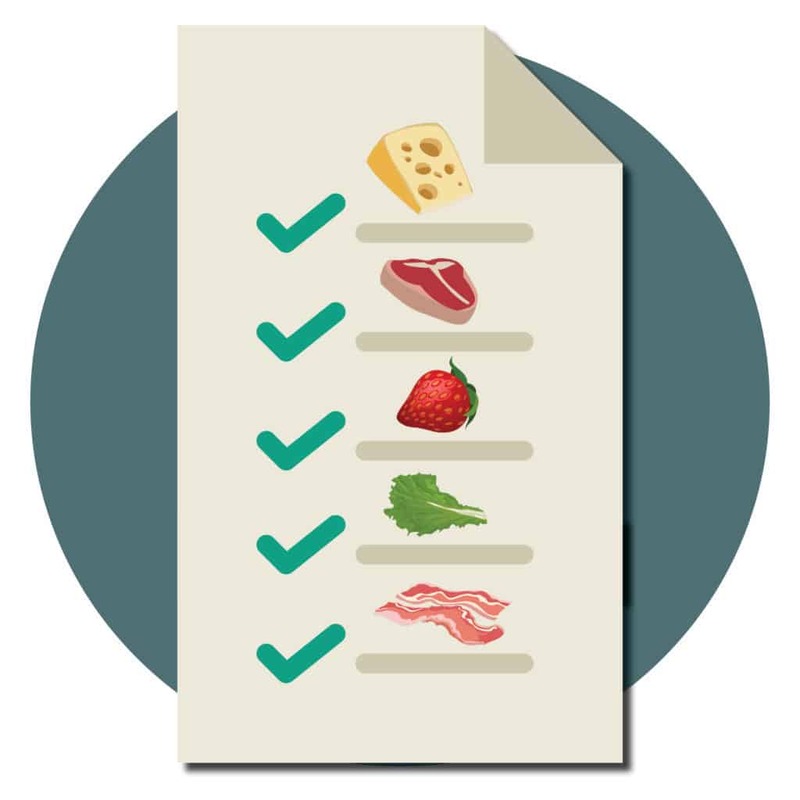 Satiety of low carb entrees – Average. This somewhat hard to judge because they offer different size plates, bowls, and entree containers. In general though, you can get full for less than $10. Taste of low carb entrees - Above Average. Most of the entrees I ordered were tasty, though much of the flavor comes from sugar. A few of the entrees were too bland. Price / value of low carb entrees – Average. Hard to judge because of varying sizes of entrees. Ordering experience – Above Average. Both times I went into Panda Express the servers were friendly and did their best to answer my questions. They also helped me structure my orders to achieve the best possible value. For speed, you can't beat their fast moving concierge-style buffet line. Panda is another restaurant who presents well-meaning "healthy" options on their menu (called Smart Wok) but mistakenly thinks that "healthy" only means low calorie. They aren't hip to the dangers of sugars & carbs...yet. Which means that of the 25+ different foods you'll see in their buffet, only 5-7 will be low carb enough to be considered. Let's not dwell on those things we can't eat, but instead celebrate the few things we can. Even though I spent three hours doing menu research and arrived with a plan, I still felt myself getting slightly overwhelmed by all the different entree, size, and combo options at Panda Express. It's definitely worth your time to do a little order planning before you go. The Panda Express equivalent of chicken nuggets. At least that's how I ate them. They were bite sized and clean enough to be eaten with your hands. Price - $7.20 for 2 servings. Nutrition - 300 calories and 8 net carbs per serving. Notes - Straight chicken, homie. Not quite as good as the best grilled chicken I’ve had on the challenge (Popeye's is #1 and KFC is #2 on that list). But close. Clean enough to eat in your car, directly out of the box. Unfortunately, much of the flavor is provided by the teriyaki marinade they grill it in and thus the high carb count. This Grilled Chicken Teriyaki entree is the most keto friendly item on the menu at 300 calories and 8 net carbs per serving and that makes me sad (as my 2-year-old son says for anything that disappoints him). String beans is a fancy name for green beans. Entree has chicken, green beans, and onions sautéed in a mild ginger soy sauce. Nutrition - 190 calories and 9 net carbs per serving. Notes - Too heavy on the green beans from a presentation standpoint. Must be eaten in moderation due to the carbs. Definitely don't drink the sauce left sitting at the bottom of the takeout container (too many carbs). Chicken is flavorful and delicious. I’d order this again. Slight sweet, but mostly savory flavor profile. Low calories make this a good fit for the 1200 Is Plenty crowd. Chicken, mushrooms and zucchini tossed in ginger soy sauce. Price - $3.20 for 1 serving. Nutrition - 220 calories and 10 net carbs. Notes - Good savory mild flavor for the chicken. Chicken and zucchini had good texture. I can't eat mushrooms due to an allergy but the mushrooms seemed to have a good tensile strength when I prodded them w/ a fork for what that's worth. 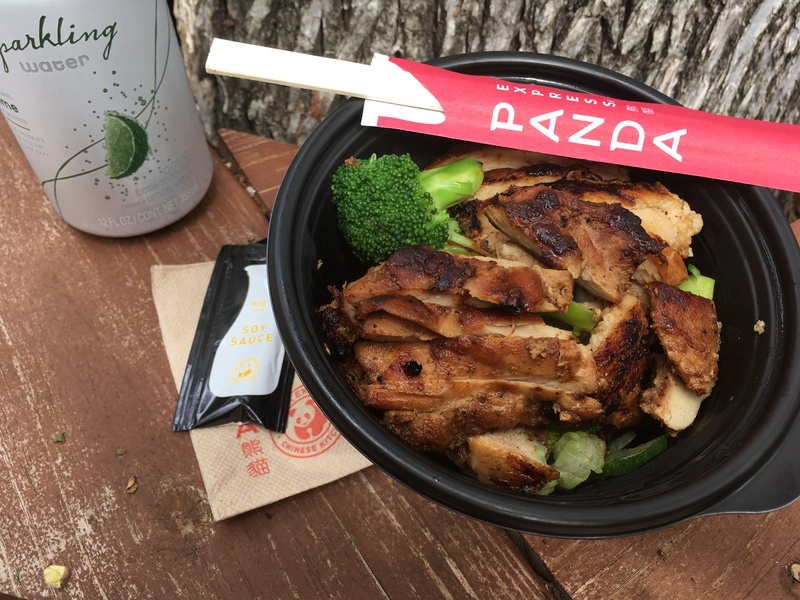 Panda gives you the option to order your entrees in a bowl, a takeout container, or a styrofoam container. It's confusing. This is the first entree I ordered in a bowl. It came with beef, broccoli, and ginger soy sauce. Nutrition - 150 calories and 11 net carbs. Notes - Avoid! Sucker's play (high price, not a ton of food). Too low calorie to be satiating. Bowl presents well, though it was a little under filled. Broccoli was crisp, not as tender as I like, but crisp is better than mushy. Dish is a little bland. Paired well with hot mustard sauce. Classic Chinese dish. I remember my parents ordering this when I was a kid. 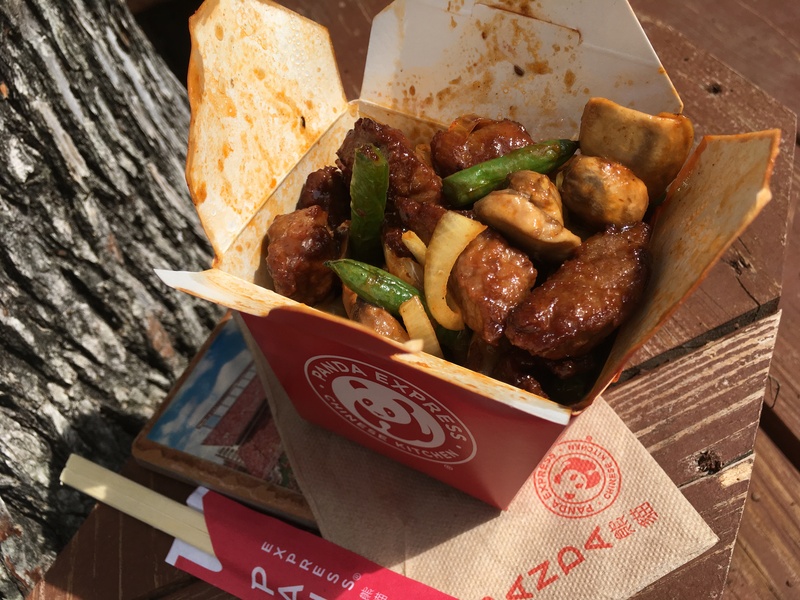 Panda's version has chicken, peanuts, zucchinis, onions, red bell peppers, chili peppers, and a medium-spicy Szechwan sauce. Nutrition - 290 calories and 12 net carbs. Notes - Very good. Good heat. It’s a medium spicy on my scale. Good flavor. Good tender chicken. You can eat around the large zucchini chunks to save a carb or two. Pretty filing. Lots of bites. So not necessarily caloric dense, but satiating from a time-to-consume standpoint. I left about ⅓ of the veggies to save carbs. Nutrition - 290 calories and 14 net carbs. Notes - We're getting into "can't eat if keto" territory here. Lots of carbs for only 290 calories. Has a signature medium-hot black pepper spice that lingers. Good flavor. Liked it. Ate it all, then looked up and thought whoa, that went fast, I want my carbs back. This is a dish that I would normally gravitate to. Unfortunately it has too many carbs to be a low carb fast food staple. This is one you nibble on, then chastise the company for adding too many carbs. 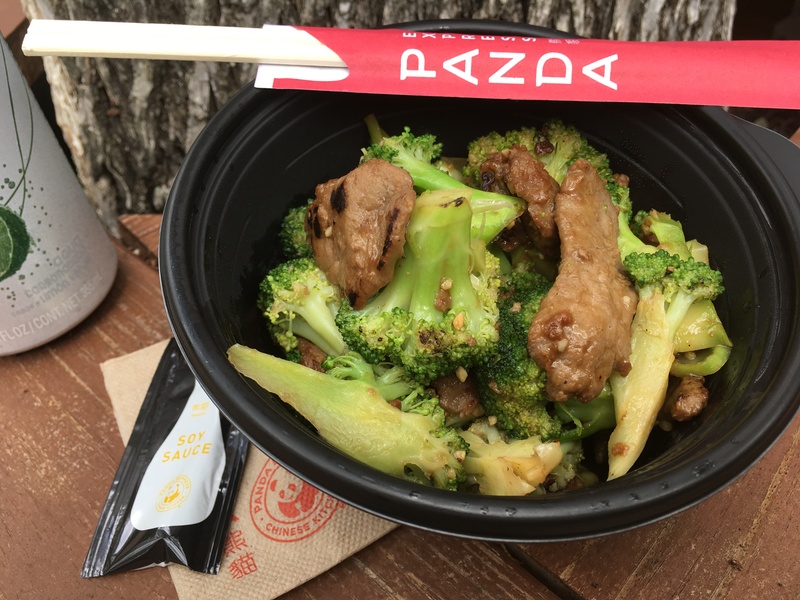 So here goes: "Dear Panda Express, please try making this dish with fewer carbs. - ryan"
Price - $9.60 for 2 servings. Nutrition - 320 calories and 16 net carbs per serving. Notes - Too expensive. Steak pieces are thick. Looks premium and indulgent -- definitely the most appetizing. This isn’t spicy enough. Has some savory flavor with a tinge of spice. Steak needs more flash frying for crispiness, but it's still good. I’m allergic to mushrooms so my wife ate the full dish -- she liked it. I got a little confused and ordered this even though it was somewhat redundant with some of the other stuff I'd ordered. According to the Panda Express website, the mixed veggies side features "a healthful medley of broccoli, zucchini, carrots, string beans and cabbage," however the scoop I got was mostly broccoli. They top off the mixed veggies with a serving of their Grilled Chicken Teriyaki. Notes - Very bland and dry. Mixed veggies are mostly broccoli (w/a little bit of cabbage, carrots, and zucchini) which means their carb estimates are overstated in this case which is a good thing. Veggies are too crisp and under-flavored. I was expecting this to be drenched in sauce, but it’s not. Needs more spice / flavor. 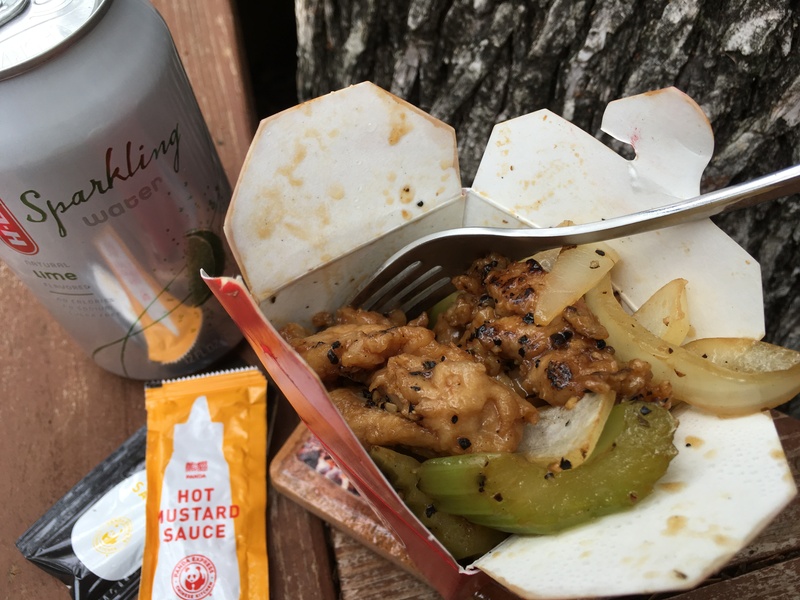 I went back to Panda Express for a third time to order it myself: For a total of 643 calories and 18 net carbs at $6.00*, it looks appetizing and tastes delicious. You can shave 1-2 net carbs by not eating the carrots. If 18 net carbs is too many carbs for your daily quota, then forego the mixed veggies, get a single order of Grilled Chicken Teriyaki, and hold out til your next meal when you can eat something that's more keto appropriate. *I think I was undercharged by the cashier. It should have been $7.20. 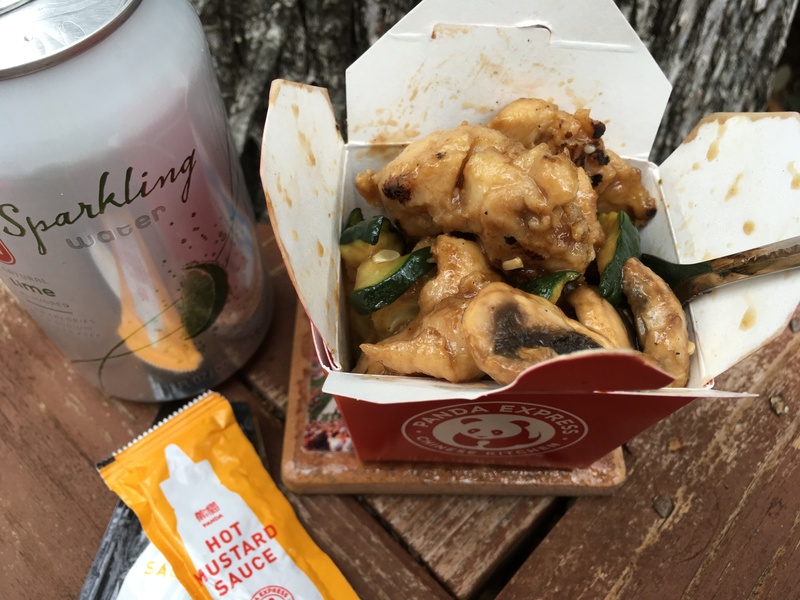 Review my Panda Express Low Carb Menu one-pager if you want to see full macros for these entrees. It's also great if you're looking for the full Panda Express keto menu. My personal low carb menu is derived from this much longer and more complicated Panda Express nutrition menu.